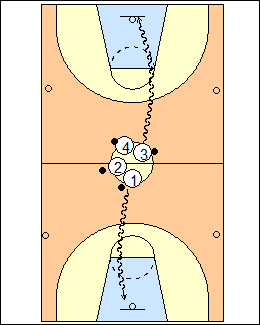 Use six baskets, players are paired up, each player has a ball, all start in the jump circle. Here only two pairs are shown for clarity, 1-2 and 3-4. Repeat going clockwise, dribbling with the left hand. 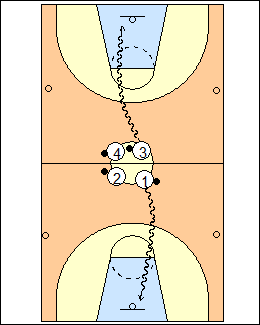 1 and 3 take a regular right-hand layup at different baskets. 1 and 3 dribble back to the jump circle and keep their dribble alive while 2 and 3 take their layups at the same baskets. 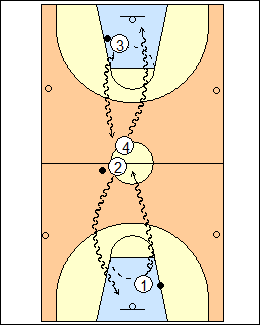 1 and 3 take layups at their next baskets (counter-clockwise) while 2 and 4 dribble back to the jump circle. With 12 or more players, 1 and 3 may need to wait for players in front of them to clear the baskets. 1 and 3 will dribble back to the middle while 2 and 4 take their next layups. 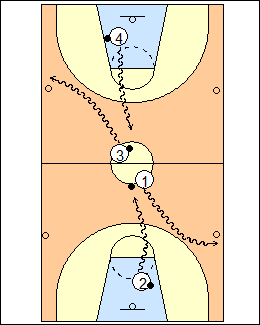 Continue going counter-clockwise until all players have taken a regular right-hand layup at each basket, repeat with reverse then power layups. Variation - use different finishes, e.g. Euro-step at the main baskets, half reverse when finishing on the other side etc. See Layups - Starburst pairs.